The good thing about enjoying baking is that there is always an opportunity to bake at any occasion, however big or small. Tonight we are going to see our friends who are having a baby very soon so I thought it would be nice to take along a cake as well as a present for the little baby to be. Because I was working in the day I needed to make a cake that would be quick and easy to do and didn’t really need any thinking about so i went for my favourite, chocolate cake. I havent got too many ingredients in my baking store cupboard at the moment but I always have the things to make a chocolate cake. I also always have raspberry jam as a staple so that would go nice as a filling and then to decorate I thought i would make a simple chocolate buttercream on it with grated white chocolate and milk chocolate drops. It’s not a hugely elegant design but it does say, put the kettle on and EAT ME! Pre-heat the oven to 180c or Gas mark 4 and line two 8″ round cake tins with greaseproof paper. Put the butter/marg and sugar into a bowl and cream together till it goes a nice pale yellow colour. Measure out the flour and cocoa powder and mix together in a separate bowl. Put one egg and two tablespoons of flour/cocoa powder into the creamed butter/marg mix and gently mix together till it has all combined. Do the same with the next two eggs and flour, until they are mixed in then add the last part of the flour and fold in together. Try not to over mix but you also don’t want any lumps, it should be a nice smooth mix that just drops off the spoon. Separate into the 2 cake tins and put into the oven for 20-25 minutes. Make sure you don’t open the oven door before 20 minutes as you risk the cake sinking. Press the top of the cake with your fingers and if it springs back up (or a skewer comes out clean) then it is done, if not then put back in for 4 minutes at a time. Turn out and leave to cool. To make the buttercream is easy because you don’t have to be very exact with this. Mix the butter or marg till it is soft in a bowl with the drop of vanilla essence. Then carefully work in the icing sugar and cocoa powder. Do this a little bit at a time until it is sweet enough for you and is a lovely soft consistency. It will get fluffier the more you mix it. To assemble the cake, put a small bit of jam onto a cake board and put the base of your cake onto it. Spread plenty of raspberry jam onto the base (about 2-3 tbsp) and spread evenly but don’t go right to the edges as when you put the top on it will squidge it all down a little. Put the top of the cake on and then cover in a layer of your chocolate buttercream. You can add your own decorations and make it as fancy or simple as you like. I went for simple and put some milk chocolate chips on and then grated white chocolate all over. 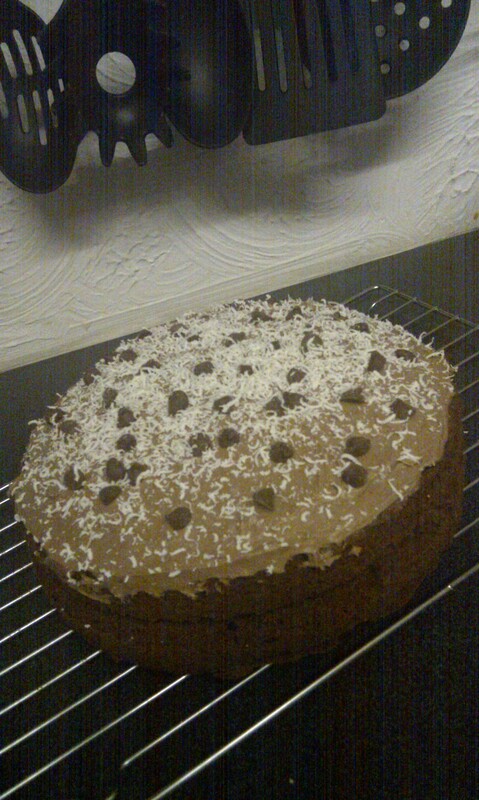 It is now ready to eat and will last a few days if stored in a tin… though cake doesnt last long in our house.